Income Producing home and Casita in Ventana / Tortuga: Main home has ocean view, 2 bedroom2 baths, large terrace and lots of shade from surrounding jungle. Built in 2002, this home shows very new due to quality construction and great maintenance. Views of the Terraba River meeting the pacific are abundant. 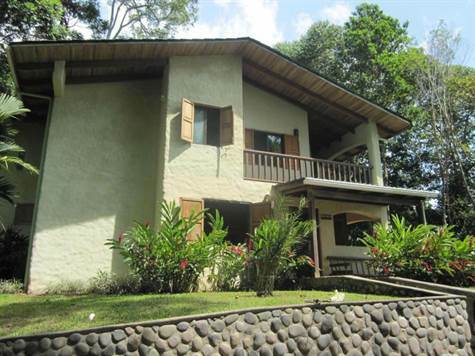 Access is from the Costenerra hwy and is only minutes to all the famous restaurants of Ojochal. Private entrance gate and lots of room for future expansion if desired. Ample parking for guests and a walk ing path to a wonderful view-point. Very private and secure. Casita home is a 1 bedroom / 1 bath. Ample space to add small dipping pool, yet has wonderful area for BBQ and relaxation. Separate ample parking with lots of space for privacy from the main home. Ventana is home to one of the top beaches, Playa Ventanas with caves perfect for kayaking and enjoy Costa Rica's finest in outdoor activity. Established rental income and documentation for both homes to qualified buyers only. A wonderful, large property, with room for expansion or to enhance with more privacy elements.